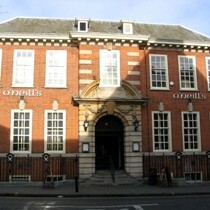 O'Neils is a large pub at the top of Victoria Street, formerly a Firkin pub and before that it was the main library of St Albans. Mainly frequented by young people and many of these appear to be students. A great place to watch the football as they have a projector and a couple of plasma screens. Only one real ale is available, Fullers London Pride, but this was top quality when we visited. They have a good selection of lager, both standard and premium. O'Neils hosts comedy nights and bands. Oasis type music in background. Large building so normally fairly comfortable to stand without being squashed in. The bar is long so it's fairly easy to get to the front when busy and service is usually good. Plenty of room for standing but also many tables for those who prefer to sit. Good lively atmosphere about this place without it being too noisy. Doormen at weekends trying to ensure no under-aged drinking and preventing any trouble getting out of hand. Open late on Thursday, Friday and Saturday (1am or 2am).